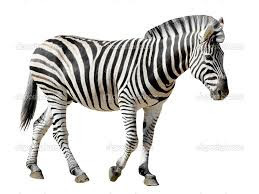 Zebras have unique pattern of Black and White stripes. Zebras live in Eastern and Southern Africa. Baby Zebras are called as foals. Zebras eat grass and leaves. The ears of zebra show its mood. Zebras communicate with their facial expressions and sounds. Zebras run very fast. They can run 35 miles per hour. When zebras are grouped together, their stripes make it hard for a lion or leopard to pick out one zebra to chase.